Location: County Down, Northern Ireland. Notes: Narrow Water Castle is a famous 16th-century tower house and bawn near Warrenpoint in Northern Ireland. 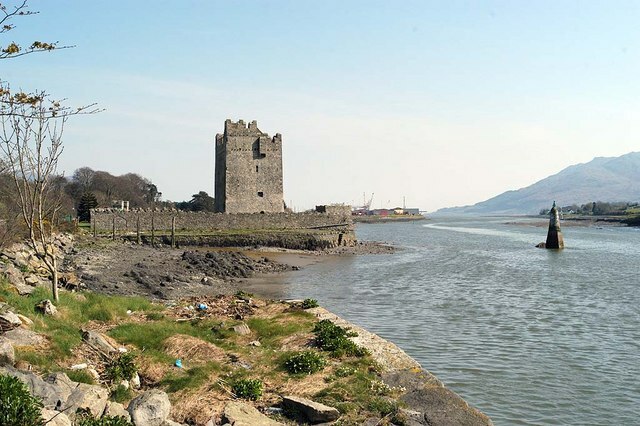 It is beside the A2 road and on the County Down bank of the Clanrye River, which enters Carlingford Lough a mile to the south. Narrow Water Castle was given into state care in 1956. It is a state care historic monument in the townland of Narrow Water, in Newry and Mourne District Council district, at grid ref: J1256 1939. In 1212, a keep was built on the site by Hugh de Lacy, first Earl of Ulster, to prevent river-borne attacks on Newry. In the 1560s, the tower house and bawn were built. It is a typical example of the tower houses built throughout Ireland from the 14th until the early 17th century. This kind of building, normally rectangular in plan and three or more storeys high, comprised a series of superimposed chambers, with stairs, closets and latrines skillfully contrived within the walls (which are 1.5 metres or five feet thick in places) or sometimes contained in projecting angle turrets. The original was destroyed in the 1641 Rebellion. Nowadays, cruises past the castle are a regular feature throughout the summer months. On 27 August 1979, 18 British Army soldiers were killed by a Provisional IRA ambush at Narrow Water Castle (see Narrow Water ambush). It was the greatest single loss of life for the British Army during The Troubles.